The songwriting magic of John Lennon and Paul McCartney affected Tracy deeply and sparked an interest in music that lead him from the Beatles to the Byrds to the Flying Burrito Brothers to The Band...and Tracy's own style of songwriting began to evolve. Today, Tracy is an award winning songwriter and The Stringbenders is the primary vehicle for his own creative output, as well as an outlet for his desire to, in the words of Willie Neslon, "make music with his friends". 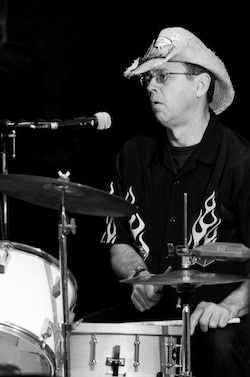 Jim Ferguson has been playing and writing songs since his college days. An attorney by day, Jim sheds his coat and tie at sunset, and takes on his alter ego as lead guitarist and songwriter for The Stringbenders. A chance meeting in 1999 at an open mike event brought Jim and Tracy together and they have been picking and grinning and making great music ever since. Jim and Tracy share similiar songwriting influences, and though their styles are complimentary of each other, they are quite different. A unique blend exists in the synergy between these two, and it comes out at every Stringbenders show. Benny Rod has been playing drums since 1968, when he was first attracted to the percussive sounds of all the great drummers of the day. 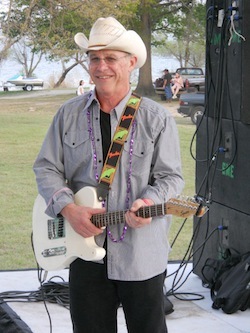 An accomplished musician who plays guitar, harmonica and about 15 other instruments, Benny holds down the backbeat for The Stringbenders and can also be heard singing some of the high harmony parts. Benny has been a Stringbender since the beginning, and is an avid collector of guitars and other musical instruments, and can be found eating wings or browsing the pawnshops of Houston when he's not playing with the band. Joe has been fascinated by music from a very young age. 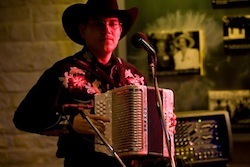 Growing up in South Texas exposed him to country, rock and traditional Mexican music. Joe learned the ins and outs of music in middle school band playing the alto saxophone. The hair band movement of the 80's and early 90's inspired him to learn the guitar. 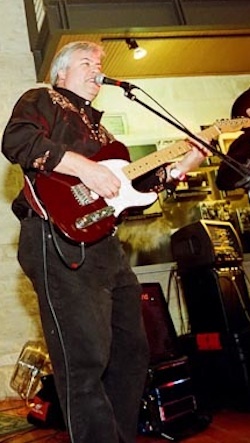 While studying at Texas A&M University, Joe regularly performed at open mikes in the Bryan/ College Station area. On a whim in the mid 90's, he purchased an accordion and has not been the same since. Joe hooked up with the Stringbenders in 2005 through a conversation with Benny Rod at a Northside Houston open mike. 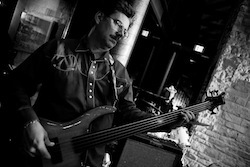 Joe has performed with local artists: The Kyle Redd Band, Larry Sepulvado and the Mark Miller Band. Pat began his love of music at an early age thanks to the various genres of music from his older siblings record collections. A native Houstonian, he is influenced by the rock, blues & country scene of the '60s & '70s, as well as many of today's current artists. His first musical experience was playing the trumpet in middle school as well as high school. It was there, after a marching band rehearsal on a Texas summer day, that he and a couple of friends decided to start a rock n' roll band. He bought a bass guitar ("because somebody's gotta play bass") and began a journey of over 25 years of playing in and around the Houston area in a variety of bands. By day he works in the security industry, but by the glow of the neon, he's one of the driving forces of The Stringbenders rhythm section since 2005.